Follow author Fred Warren through the twists and turns of twenty-two bizarre tales, where odd is commonplace, little things make all the difference, and miracles are everywhere, if you know where to look. 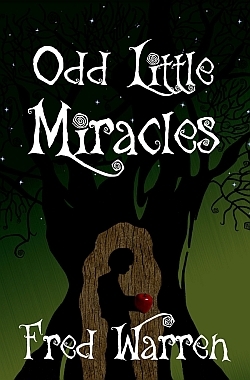 Short story collection, fantasy and science fiction for teen readers and older. An office temp thinks he has the world’s worst job, until he spends a day sitting in for the Devil. A young woman discovers something growing in the fields outside her village — something wonderful … and terrible. Short story collection, fantasy and science fiction for teen readers and older. A variety of story lengths, topics and genres kept me far more interested than I expected to be. The writing style, especially the fabulous dialogue, sucked me in and the reading was over way too fast. My favorite story (Rubes) was one of the longer ones but I liked them all. I started with the e-reader version, but I’m buying a hard copy to keep on my shelf. I suspect I’ll be loaning it out a lot. You can bet I’ll keep my eyes open for the next short story with Fred Warren’s name attached. If short stories are the snacks of reading, then Fred Warren’s collection is like an old fashioned ice cream sundae with all your favorite toppings, including a few you never thought to try before. Each story adds a flavor or texture to the whole, some quick to the tongue and some with an aftertaste lingering long after the meal is over. In this book, drawn from his many serial publications, Warren weaves together an odd assortment of tales that are both fantastical and true, in the purest sense of emotional, spiritual truth. What unites this odd bunch of characters are their humanity, both beautiful and ugly, and the choices they face. Sometimes these choices are comical, sometimes tragic, often poignant, never dull. As with any anthology, some stories stand out more than others. Here are some thoughts on a few of my personal favorites. In “The Devil’s Temp,” an office drone is faced with the ultimate out-of-office assignment: supervising hell itself. Warren revels in the ridiculousness of the situation, one the man faces with Dilbert-like detachment, but which also forces him to reexamine his passive acceptance of evil. “Rubes” focuses on a circus stuck in the middle of nowhere, forced to play for a most unusual prairie crowd. The carnies do their best to make the most of a bad deal, but discover that sometimes the salt of the earth aren’t as bland as first meet the eye, nor as “safe.” This story really brought out Warren’s talent for characterization, packing in so much color into so few words, and also proving that miracles aren’t without danger. What’s the most humane way to avenge a death? That question, explored with pathos and grim irony, is at the heart of “The Time Share.” To say more would give it away, but this futuristic solution to the problem of punishing those who cause death is far more disturbing and thought-provoking than many a dark dystopian novel tries to be. What seems impossible now is often just around the corner, or thrust upon us before we truly realize the consequences. Several of these stories are about first contact with an alien race. “An Eternal, Unbroken Chain” and “Bullies With Big Fat Heads” both explore how lack of open communication at these meetings can lead to dark comedy, and I enjoyed them both. But the best, most heartfelt narrative in this vein is “Pilgrimage,” a story about two diplomats, one human, one alien, and their struggle to find common ground. I appreciated how the alien race was fully developed, especially with so few words and minor exposition, and in ways that many science fiction shows aim for but can’t quite reach. These two characters inhabit very different worlds, and have very strong beliefs, but both are dedicated to truly learning about the other and communicating, which is often slow, difficult, and personally challenging. The ending was open ended (in a good way), and I’d love for Warren to revisit these characters and their journey in a future story. As a side note, it passes the Bechdel test with flying colors, going one better by featuring two females of opposite species. As a final recommendation, these stories are short enough they make excellent bedtime reading material even for weekdays: just enough to entertain without enticing one to stay up too late. However, don’t judge them merely on their length. Even after several reads Warren’s unaffected prose is a delight to experience. The poignancy and irony of his style packs so much depth into so few pages, proving brevity to truly be the soul of wit. I highly recommend this anthology.